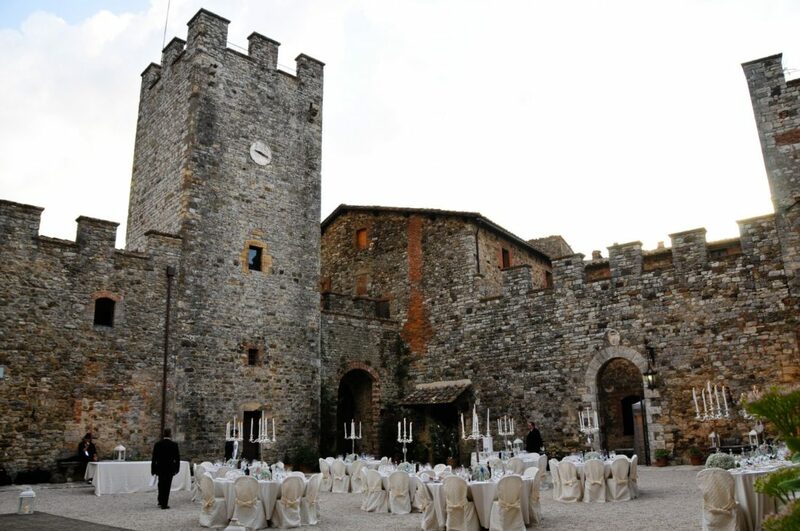 If you have been dreaming about having your wedding in Tuscany, you need to look no further than Modanella Castle, which dates back to the 12th century and dominates the village of Modanella. Beautifully maintained, it sits on a hill and is surrounded by groves of olive trees and vineyards, and has a true Tuscan atmosphere. Situated near Siena and Florence in the Chianti area, it is the ideal location for a luxury or a fairy wedding; giving you and your guest the opportunity to explore the beautiful Tuscan countryside before or after the wedding festivities. There are several options offered for your wedding banquet at Modanella Castle; from a fantastic wedding buffet or a sit-down dinner for up to 130 guests in its large courtyard, or in the magnificent room of the arch, the oldest room of the castle. Modanella is your dream castle for your wedding in Tuscany. Modenna Castle also houses the San Giovanni Battista Church, where you can have your wedding ceremony: it is very romantic and intimate. As an alternative, you can have your blessing in the gorgeous garden. Should you be planning a summer wedding, you and your guests can enjoy prosecco, one of Italy’s sparkling white wines, and canapés in the beautiful Italian garden, and then have your al fresco dinner in the courtyard. Local produce is carefully chosen each morning from the market by the chefs in the castle’s kitchen, resulting in high quality ingredients, which in turn provides for high quality food for your wedding reception and the meals in the restaurant. Let’s face it; nobody wants frozen chicken served at their wedding – in any country – but here the food is not only good, it is a top-quality, delightful experience! Modanella Castle estate is also home to a winery, which produces six excellent wines, including white and red varieties. There is a restaurant and bar at Modanella Castle which could be utilized by guests who are staying in the area, possibly in one of the farmhouses that have been converted into apartments for guests attending weddings at the castle, and all are situated less than a mile from the castle itself. These are working farms which are part of the large Modanella Castle estate, and the apartments are rented out to vacationers and guests who are attending weddings in the castle. The accommodation capacity of Modanella estate is up to 200 guests, including several apartments and one private villa, that can lodge up to 16 people and has a private swimming pool. Staying at Modanella Castle with your guests before and after the wedding is like having a long wedding. BeA Alfresco Wedding can organize your private parties by the pool, and you can enjoy a pizza party, a lasagna party, a BBQ party, or simply a welcome party. All in all, Modanella Castle is a fantastic place to have your wedding and reception – the food is great and the location is unbeatable!